www.photomacrography.net :: View topic - can 'enough' stacking save a non flat field objective? can 'enough' stacking save a non flat field objective? Posted: Mon Aug 25, 2014 5:23 am Post subject: can 'enough' stacking save a non flat field objective? I am saving up for new Mitutoyo Plan Apo objectives (10x and 5x). Until then, would stacking deep enough and small steps (2 um) be enough to correct for curvature in non plan objectives? I am currently practicing on microscope slides with the Nikon D800E, bellows, and Leitz finite objectives. Or am I better off using some Nikon Plan infinite objectives (can't currently recall which I have/I'm currently traveling) with a tube lens such as the Raynox DCR-150? Also, will stacking 'save' me if my lens front plane is not perfectly parallel to the plane of the slide? I do not understand optics as well as most here. Also, what does the M stand for in Mitutoyo 'M' Plan Apo.... I've seen their objectives referred to as with and without the 'M' and was confused as to whether there two lenses or the references were for the same objective. (will probably buy from Edmund's). Posted: Mon Aug 25, 2014 6:20 am Post subject: Re: can 'enough' stacking save a non flat field objective? Until then, would stacking deep enough and small steps (2 um) be enough to correct for curvature in non plan objectives? Also, will stacking 'save' me if my lens front plane is not perfectly parallel to the plane of the slide? Yes to both. For an extreme example, see http://www.photomacrography.net/forum/viewtopic.php?p=57849#57849 and compare the single frame with the stacked result. "M" is a common designation for "metallurgical", which is shorthand meaning that the objective is designed to be used without cover glass and has sufficient working distance to illuminate around the objective. If you see a Mitutoyo objective discussed without the "M", it's probably an meaningless omission. The objectives at Edmund HERE are really M Plan Apo's even though Edmund omits the "M" in their description. Compare with Mitutoyo's description HERE, page 16. Thank you, Rik, for the informative (stacking) and interesting reply (on 'M'). I should probably look at a slide under the microscope first prior to stacking it off microscope with the camera setup I have for a better visual reference point. I have also ordered a 'mini' level to place on the end of the StackShot motor to have a better chance of being more level (parallel planes). Though it's encouraging to know stacking can make less than the best lenses still very usable. Conventional microscope objectives lack correction for spherical aberration , causing a focused central area and progressive blurring towards the edges. This is also accompanied by progressive chromatic aberration towards the edges, which can be more or less depending on the maker. The periphery of the image can be brought into focus , so yes stacking can be used for that purpose but some other method of correcting for the chromatic aberration must be employed, otherwise as much as 50% of the image will have some degree of distortion. You referenced using your objectives on a microscope and testing with slides.You didn't state the nature of the subjects or if you were using coverslips. Perhaps they were prepared slides? That caution about the meaning of M is really important, if you intend on using MItutoyo objectives because they are designed for incident illumination , without cover. They could be used for transmitted illumination of thin smears or thin transparent subjects without cover too, however, they have been corrected for incident illumination and have an exceptionally long working distance, so finding a condenser with a compatible working distance for your stand, might be difficult. Objectives vary in their response to a coverslip. Some absolutely must have the exact thickness within .01mm and others hardly seem to be affected at all. Low magnification objectives , such as these 5x and 10x ones, often show little effect, with the designation - on them instead of a 0. I would contact Mitutoyo and see what the possibilities are for these , if you intend to use them on biological subjects. Also they have a specific MItutoyo thread, so require adapters for an R.M.S. microscope( this will affect the tube length) and are very long. Not all stands have a focusing range to accomodate them. MItutoyo are in a class of objectives called " industrial objectives", where working distance is of prime importance.They are generally made to be used on Mitutoyo industrial stands. There are others in the field , that you could pick up for only a few dollars surplus, to test your system, prior to investing 1500.00. Bausch&Lomb made an industrial microscope called the microzoom and there were a series of planachromats for it. They have similar characteristics to Mitutoyo, with long working distance and are actually very good---mags. 1x to 6x I believe, with iris diaphragms( black) and 2 up to about 40x without( silver). There is a black 45x with an iris too but it seems to sell high on the used market. I've seen whole sets of them go, however, for around 100.00(ebay). I think they have standard R.M.S. threads . They may be a little longer than the Mitutoyo and I believe they are 211mm tube(?). They were branded Cambridge later on and then Leica but they are Bausch & Lomb. Because of the limited depth of field in microscopy, I focus stack the majority of my images. Here is an article I wrote on the technique. Conventional microscope objectives lack correction for spherical aberration , causing a focused central area and progressive blurring towards the edges. The effect described by phil m is "curvature of field", not "spherical aberration". Spherical aberration describes a different problem, in which light rays coming through the center and edges of the aperture (not the field) focus at different distances. Spherical aberration degrades image contrast for fine detail even at image center. See the article on spherical aberration in Wikipedia for more information. This is also accompanied by progressive chromatic aberration towards the edges, which can be more or less depending on the maker. Objectives vary in their response to a coverslip. Some absolutely must have the exact thickness within .01mm and others hardly seem to be affected at all. True. This is directly related to the NA (numerical aperture). Leaving off the coverslip (or providing one when it's not expected) has no visible effect at NA 0.25 and below, is slightly visible at NA 0.40, and quickly becomes important beyond that. Since NA is usually tied to magnification, the rule of thumb is that cover slip doesn't really matter at 5X or 10X, might matter a little at 20X, and matters significantly at 40X and above. Also they have a specific MItutoyo thread, so require adapters for an R.M.S. microscope( this will affect the tube length) and are very long. Not all stands have a focusing range to accomodate them. To provide some numbers... Mitutoyo objectives are designed to focus at 95 mm from the shoulder of their mounting threads, versus only 45 mm for DIN standard (most RMS threads). It is very unlikely that a stand designed for ordinary DIN objectives will have enough focusing range to accommodate them. Bausch&Lomb made an industrial microscope called the microzoom and there were a series of planachromats for it. They have similar characteristics to Mitutoyo, with long working distance and are actually very good---mags. 1x to 6x I believe, with iris diaphragms( black) and 2 up to about 40x without( silver). There is a black 45x with an iris too but it seems to sell high on the used market. I've seen whole sets of them go, however, for around 100.00(ebay). I think they have standard R.M.S. threads . They may be a little longer than the Mitutoyo and I believe they are 211mm tube(?). They were branded Cambridge later on and then Leica but they are Bausch & Lomb. This is very interesting. Do you have a link to a picture that shows what these beasts look like? Thank you, Phil, Michael (have bookmarked your page), and Rik, for your comments and link/s. My micro interest is much broader than my current skill set or even knowledge, but I am making some progress. I think I will still save up for the Mitutoyo objectives because I want to photograph 3D subjects (small parts of insects/plants/other), but I also have simple histology slides with cover slips purchased from Carolina.com (both human and other animal and plant species). I do have some plan Nikon infinite objectives (from a Nikon Eclipse E200 educational microscope that sits on my home desk), but I have taken to trying to photograph slides from my Nikon camera/bellows or tube lens depending on objective (I also have some Leitz Wetzler finite objectives from an Ortholux microscope I don't use) because of the small steps capability of StackShot. I'll try a slide with more distinct cells from side to side (like epithelium) so maybe I can tell if I couldn't see a focus point on the sides due to tissue (was a small mammalian kidney, maybe a mouse?) or whether it was curvature of the field of a non plan objective. Or I could also try to simply move the side of the slide to the center of the field... not home right now. I have done panoramas of slides with cover slips (usually 10x or less) with a 5MP cam through the microscope eyepiece using center fov sharpness and no stacking, but again, I think my better setup (for what I have to work with) will be stacking focus planes via StackShot/Zerene Stacker/dSLR to microscope objective route. Eventually, I would love to tackle 20x or greater, if possible, on some of the histology slides I have. Thank you for the images. 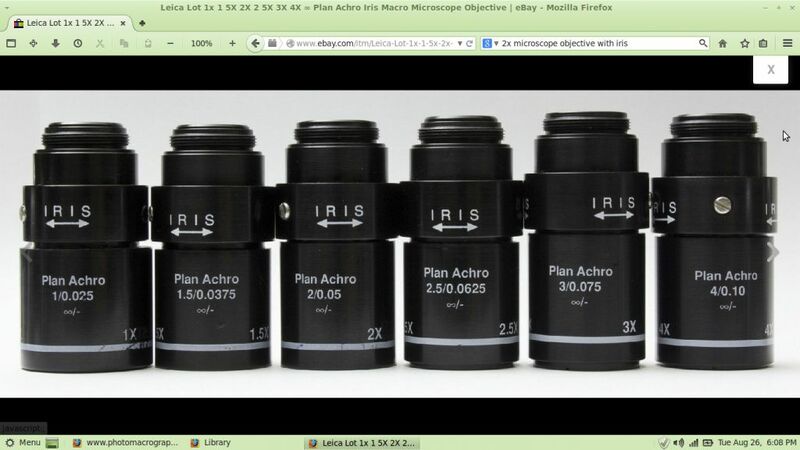 The second set (the black ones) are clearly marked as being infinity objectives, designed for use with some tube lens. I suppose the silver ones are also, though I can't read the labeling on them. There is also an ongoing sale eBay 261564527250 of one objective alone, with lots of pictures, but none of them indicate finite vs infinite. Quick search on eBay shows that one full scope is being offered right now with four of the silver objectives, "50X 0.45 N.A., 25X 0.31 N.A., 8X 0.15 N.A., 2.25X 0.04 N.A." At corresponding power, these are somewhat smaller NA than the Mitutoyo's (c.f. 50X NA 0.55 and 20X NA 0.42). The prices are very attractive, but with no reports on the size of the high quality field or CA behavior these would be treading in unknown territory. The microzooms were widely used for wafer inspection for 20 or so years.... being replaced over time. The head looks the same as that used on the Balplan microscope which could accommodate a little better than 20mm f.o.v. but the optional microzoom head went up to 24 , or so . It would seem then that those silver microzoom objectives would be pretty flat beyond 20mm, at the least. They are a fixed tube objective. That whole era at B&L was a bit clouded in mystery, as far as tube lengths go. The Balplan objectives , although they at the time were probably the best planachromats made( so good, that they dropped their previous fluorite line because the planachros were better, almost completely free of chroma, even in barely resolved areas) cannot be used on any other microscope and visa versa. They are not marked with a tube length but even beyond that there is a negative lens or something else in there that needs specific correction. Yet, the Balplan met objectives( 25mm thread) are marked 211mm and the one I have ( 80x .90 flat field fluorite) works perfectly well on a Balplan biological scope....even with a coverslip. Flat, corrected and a beautiful high magnification dry,fluorite quality image. So, yes the silver objectives would be an experiment to try one but then again , they show up on ebay regularly and I have seen them at very low buy it now prices. I'm pretty sure they are R.M.S. too, which is a bonus. Posted: Wed Aug 27, 2014 10:31 am Post subject: Re: can 'enough' stacking save a non flat field objective? I am currently practicing on microscope slides with the Nikon D800E, bellows, and Leitz finite objectives. I haven't yet stacked the slide, but using CamRanger and looking at 100% (the double tap), when the left and right edges of the field (this was a small mammalian kidney slice) were not in focus, it was hard to pick a focused plane (to determine the start and end positions on StackShot), and seemed to go from blurry to more blurry whether I went high or low, even though the center is in focus. This combination of symptoms suggests that your objective does not have a wide enough field of view to cover your full-frame sensor with high quality image. This is a very common problem. Your full frame sensor has 43 mm diagonal, 36 mm between the two sides, whereas most microscope objectives are designed for no more than 25 mm across the field and some old ones as little as 16 mm. The fact that modern Nikon and Mitutoyo objectives will cover full frame at rated magnification is not only a tribute to their high quality design, but also quite a bit of good luck. It could equally well have happened that they worked very well right to the edge of their as-designed field, and then sort of "fell off a cliff". The now-discontinued Nikon CF N Plan Achromat 10X NA 0.30 has something of that latter behavior, as you can see HERE when I tried pushing it below 10X by using a shorter than normal extension. Posted: Wed Aug 27, 2014 6:07 pm Post subject: Re: can 'enough' stacking save a non flat field objective? Your full frame sensor has 43 mm diagonal, 36 mm between the two sides, whereas most microscope objectives are designed for no more than 25 mm across the field and some old ones as little as 16 mm. So I guess no amount of stacking will overcome this design limitation? I should probably look at a slide under the microscope first prior to stacking it off microscope with the camera setup I have for a better visual reference point. 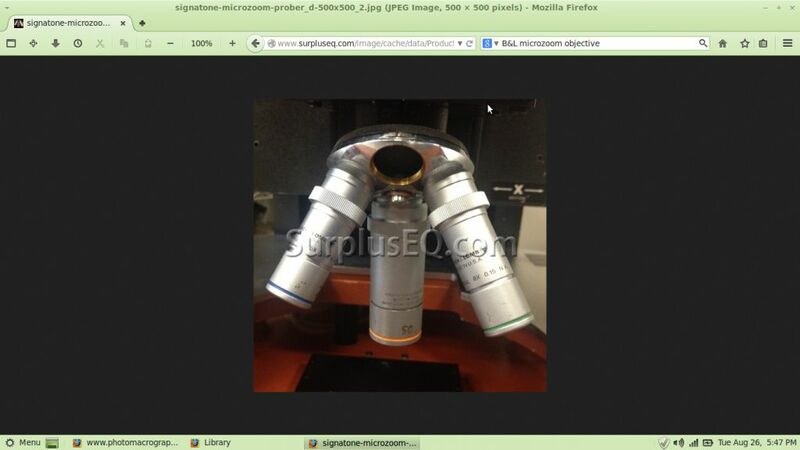 To image the microscope slides, why not to couple the camera to the microscope?. Not only the optics will be working as designed (Leitz objectives need complementary corrections done by Leitz Periplan eyepieces) but you will benefit of the adequate transillumination with condenser. To use a FF camera with objectives with not enough coverage you could use a teleconverter to add some relay magnification. Hi, I 'sort of' did try. My old Ortholux sits unused because it was frustrating to try and find a better light source a couple of years ago, and I decided to go with newer (though novice) equipment that would be easier to source for, thus the Nikon Eclipse E200 (not trinocular, which was maybe an error if I wanted to photograph? But I thought I wouldn't need trinocular, because I had used a Celestron eyepiece imager with good results... Yes, only 2MP, but I made panoramas with relative ease, though no stacking). Then I wanted more resolution. Also, I recently bought a stereo microscope, Celestron 'Professional Stereo Zoom', and was dismayed to see broad horizontal ?rolling bands when I held a dslr over the eyepiece as a quick trial, but a nice fov when just using my naked eye. I already had the StackShot setup and bellows and some nice Nikon glass for 'regular' photography, so it seemed an easier work path to try. I would be willing to try to hook up my D800 to the Nikon Eclipse E200 microscope if there is a good solution for through an eyepiece, but how to eliminate the broad horizontal bands (can't recall atm if they really roll?)? I would like to photograph covered slip slides at higher powers (40x, even 100x as well as lower powers) so believe the microscope would be great, but that's where I currently sit in the matter. I will still also, though, pursue the off microscope route, since the dSLR-bellows/lens tube-objective route is more portable and I have made progress in that workflow , and I also want to do small 3D subjects. Also, I like what stacking offers, and I haven't yet stacked on a microscope (though I do now have a Cognisys motor set aside for a microscope project if I could ever happily make union with my D800. Again, open to suggestions! Being the E200 a modern infinite corrected microscope you don't need eyepiece corrections. You can try to couple the DSLR directly on the microscope with empty extension tubes or bellows with a tube lens like the Raynox inside after removing the binocular head. Maybe it will not cover the full sensor but you can use a teleconverter or just crop the image (36Mpx!). The microscope focus is very good for stacking. For more serious microscope work of course a trino head is much more convenient. You could also rescue the venerable Ortholux and adapt it to LED. Someone sells at ebay replacement LED outfits. No idea about what the rolling bands could be, pictures could help to understand the problem. For a portable stacking device for opaque 3D specimens of course the Stackshot and the Nikon objectives on tube lens is more convenient.